This is a Roman copy of Pan pulling a thorn from a Satyr believed to have been made between the 1st and 2nd century B.C. It is a copy of a Greek original which has not been found. The statue stands 70 cm high and is made of marble. Its origins are unknown as is the artist of this work; you can tell it is a Roman copy as it has a form to stabilize it, in this case a rock. 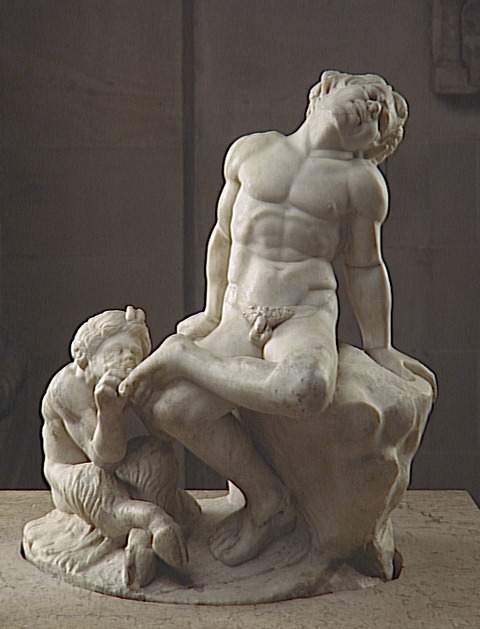 There is another very similar statue to this one which shows and older looking Pan again removing a thorn from a satyr. The statue of the childlike Pan pulling a thorn can be found in the Louvre in Paris, France.